History - Use your entry to teach us something about medieval life or real historical people and events. Movie maker - Illustrate a scene based on a (non-Arthurian) castle-themed movie. Emotional impact - Build a scene with a real emotional punch, this could be a positive emotion like joy, or a negative emotion like grief or fear. Things that go bump in the night - Halloween may be gone, but ghosts and such live on (well, they're undead). Build something with, as Reginald Scot wrote in 1584 "spirits, witches, urchins, elves, hags, fairies, satyrs, pans, faunes, sylens, tritons, centaurs, dwarfs, giants, nymphes, Incubus, Robin good fellow, the spoom, the man in the oke, the fire-drake, the puckle, Tom Thombe, Tom tumbler bonles, and other such bugs." Stay flexible - Best use of official flexible elements. These include official string, capes, sales, those flexible thin plastic sheets, nets, hoses, and other such parts. All wet - Build a MOC that centers around water somehow, like a boat, a dock, a bridge, etc. We need a hero - Best use of Hero Factory or Bionicle parts in an entry. For the movie maker award: do tv-Series like Game of thrones -count? So basically, when we post an entry, and it includes a cross category award, do we just post here saying we have it and which award? 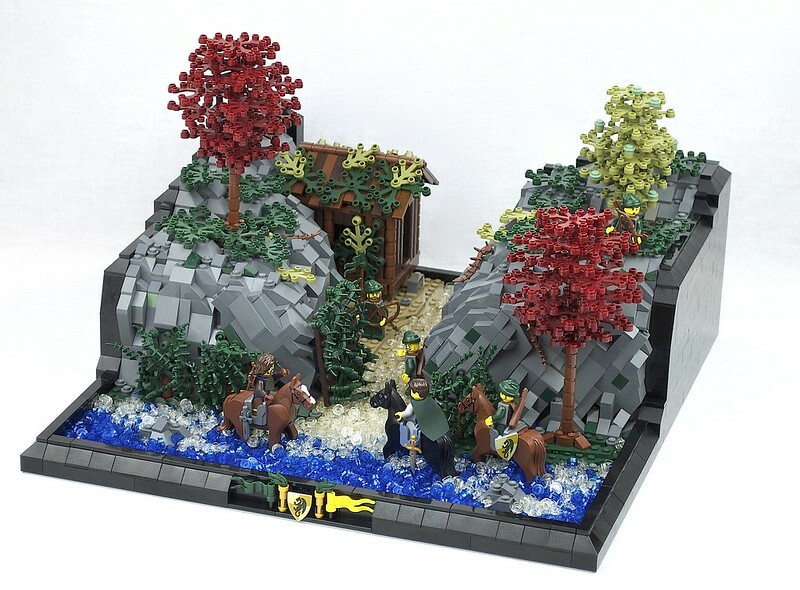 Support Huckleberry Finn on Lego Ideas! All you have to do is enter like normal. The admins will decide which entries also happen to fit the award categories. You don't have to announce which x-category award you are trying to win. AK_Brickster wrote: All you have to do is enter like normal. The admins will decide which entries also happen to fit the award categories. You don't have to announce which x-category award you are trying to win. KumpelKante wrote: For the movie maker award: do tv-Series like Game of thrones -count? Sure, movies or TV are fine. This year's CCC was a lot of fun, and in addition to the category winners, we have some special titles to hand out. History - GillesGaer has been dubbed Geoffrey of Monmouth for his recreation of Porte de Laon, Coucy. Movie maker - In recognition of his great movie scene, Cmaddison is now our resident Dragon Tamer. Emotional impact - Rifiröfi's Take your child to work day really made us laugh, and so he is our newest Court Jester. Things that go bump in the knight - Fraslund will know be known as Robin Goodfellow for his spooky graveyard scene. Stay Flexible - SeargentChimpmunk44 came up with a really clever way to make tree trunks, and so is now our official Woodsman. All Wet - Caelan is now an Aquarian for his great use of water in Go where no one else will go. We need a hero - Purple Wolf came up with a great shield for his Hobbit army, and so he appropriately gains the title Hero. For his ongoing "History of Britain" series (which has been ongoing for a couple of years now), Peggyjdb is hereby dubbed Miltonian Builder. For his portrayal of the story of William Wallace, Lolino shall now be known as Blind Harry. There's always room for dessert. "Troll exist! They steal your socks but only the left ones whats with that?" Great stuff! I took the liberty of copying Bruce's wording and adding in the links as I had a bit of time, and as I looked through the entries realised there were many that I hadn't seen before. If you haven't looked through the entry page yet http://classic-castle.com/events/ccc/view.cgi?contest=cccxi it is definitely worth looking through when you have the time. There were loads of entries that I'd missed, as either they hadn't also been posted in the forum, or weren't from people I follow on flickr and some real gems to be found. Congrats to all of the winners, some really cool stuff here! Bruce N H wrote: Stay Flexible - SeargentChimpmunk44 came up with a really clever way to make tree trunks, and so is now our official Woodsman. I am curious about this, but I cannot tell what the tree trunk is made from in the provided photo. Any hints? rogue27 wrote: I am curious about this, but I cannot tell what the tree trunk is made from in the provided photo. Any hints? It is hard to see, but I'm pretty sure those are brown Technic chain links wrapped around some core. I'd love it if SgtChipmunk would post a close-up of that tree. Yep, I connected four technic links together so that they formed a small square and then connected the squares together by threading levers through the centers. Unfortunately, I have already taken that build apart, but if I use that tree technique again in the future I'll be sure to post a close-up pic. Also thanks for the cross category award! Also, congratulation to everyone else! Location: Here one day, gone the next.